The Cattleya was built in 2013 and has 6 comfortable air-conditioned cabins, en-suite bathrooms with complete ammenities and cold/warm water showers; the cabins feature picture window views. 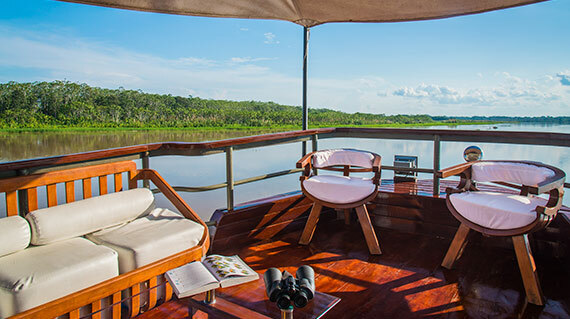 The Cattleya Amazon river cruise boat has a capacity for 12 passengers comfortably accommodated and a crew of 8-12, including 2 knowledgeable naturalist guides fluent in english and spanish. a complete package to enjoy a fantastic Jungle adventure! 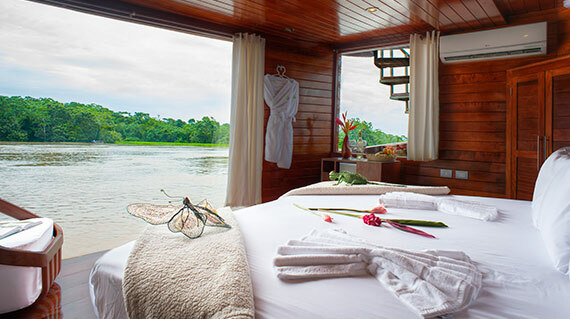 Let’s cruise the Amazon Jungle on board the Cattleya! 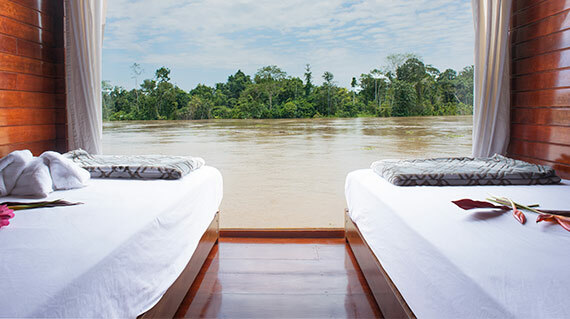 All about the Cattleya Amazon River Cruise. The Cattleya is 75.5 feet = 23 meters long, the beam is 19.7 feet = 6 meters wide, draft is 6.5 feet = 2 meters deep. With a 185 hp caterpillar engine she cruises at 16 knots. The caterpillar 48 KW encapsulated generator provides power for the 220/110 volt electrical system. Communication is by UHF and VHF radios, and by satellite phone. Welcome to the Amazon! Reached only by airplane or boat, the bustling city of Iquitos is the 5th largest city in Peru and the beginning of your Amazon adventure! You will be met at the airport and comfortably transported 2 hours by road to the town of Nauta. Finally, here you will embark our modern and newly built riverboat, the M/V Cattleya. Take some time to settle in, relax and have a drink while you get to know your fellow passengers. There will never be more than 8 guests, so you will have the opportunity to make life-long friends. Venturing deep into the rainforest, we will spend the entire day wandering through the island mazes and twisted tunnels of the igapo (seasonally flooded forest) where the dense plant life is dramatically different than what we see from the river’s edge and harbors a whole new variety of exotic wildlife. Then, we will hike through the reserve for close up viewing and discovery lead by our expert and knowledgeable guides. Examine and learn first-hand about the jungle plants their unique survival tactics as they compete for sun and nutrients in the dense rainforest, the part they play in sustaining the complex balance of life in the jungle as well as the important medicinal value they offer. 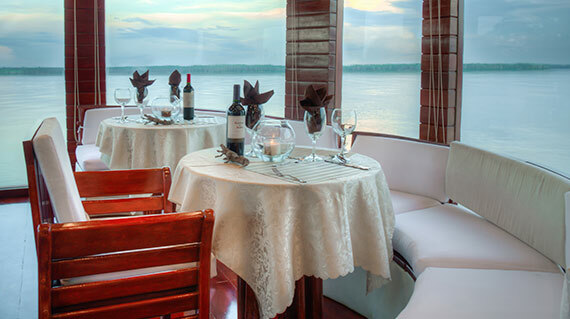 Witness a brilliant Amazon sunset as we return to the M/V Cattleya where you can savor a glass of wine or a pisco sour with your expertly prepared dinner followed by some stargazing on deck before you turn in for a well-deserved night’s sleep. After an early breakfast, we will further explore the vast wetlands of the Pacaya-Samiria Reserve. Then, add to your growing list of wildlife and bird sightings. In the afternoon, we will visit a village along the river to learn about the lives of the “Ribereño”. They are people who call the river’s edge their home. Moreover, it is an excellent opportunity to ask questions (practice your Spanish if you like!) and gain a deeper understanding of how people live in this remote part of the world. A wide variety of handmade handicrafts and delightful folk art will be available for your viewing and purchase. 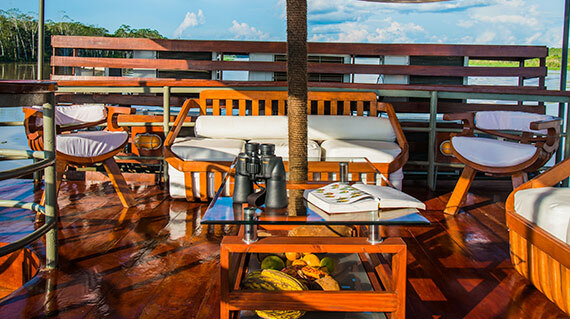 Finally, experience one of many brilliant Amazon sunsets as we return to the M/V Cattleya. 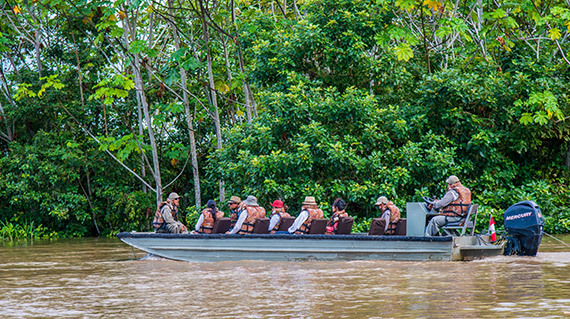 As we cruise slowly back toward Nauta, join the crew and all your new friends in a farewell dinner of authentic Peruvian cuisine and a celebration of your Amazon experience.